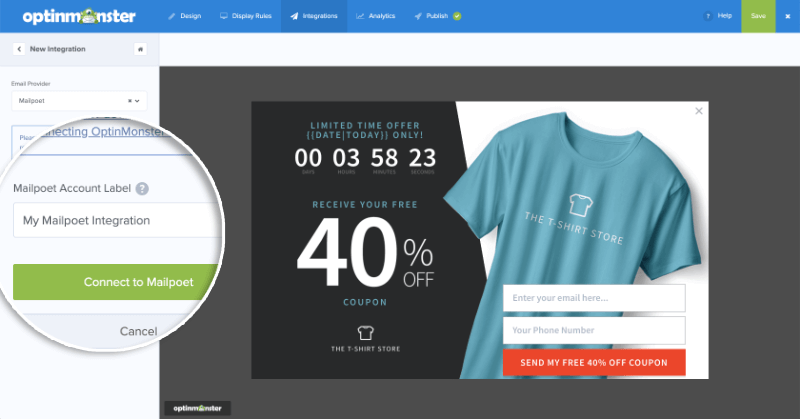 OptinMonster offers seamless integration with MailPoet (Wysija) email marketing plugin for WordPress. Connecting OptinMonster to your MailPoet email list is very easy. Follow our step by step guide on how to connect OptinMonster with your MailPoet account. Do I need to use the OptinMonster API plugin to subscribe leads to MailPoet? NOTE: Enabling Save Lead to MailPoet for one campaign affects all other campaigns on that site. If you wish to have a backup list for your leads, you may consider sending them to a Google Sheet via Zapier. Next, select Mailpoet from the Email Provider dropdown. 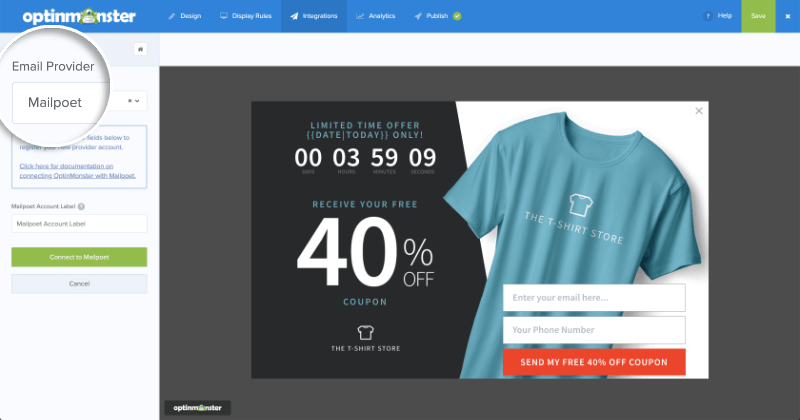 Add a label for easy identification and click Connect to Mailpoet. If you haven’t already, be sure to install and activate the MailPoet (Wysija) WordPress plugin. Next, navigate to your WordPress Admin > OptinMonster > Campaigns tab to see your available campaigns. Click Edit Output Settings for the campaign you wish to configure. On the next screen, enable the Save Leads to MailPoet? option. Choose the list you wish to send subscribers to. That’s all, you have successfully connected your OptinMonster campaign to MailPoet! A: See our guide on single vs. double opt-in for Mailpoet. Q: Do I need to use the OptinMonster API plugin to subscribe leads to MailPoet? A: Yes! It’s not possible to subscribe leads to MailPoet using OptinMonster without the OptinMonster API plugin to control where on your site your campaign loads. A: No, at this time our native MailPoet integration does not support the phone field. You can still collect phone numbers by using a MailPoet form and shortcode instead.